Join the fund team for the China Equity Fund for their update on Q119. Join fund manager Tony Jordan as he presents a Q1 update for the Asia Pacific Equity Income Fund. Fund Manager Jonathan Rawicz will run through the performance of the Dynamic UK Equity fund for Q1. Join Bibiana Carretero as she gives a Q1 update for the Dynamic European fund. Simon Hodges presents a update on the performance of the Global Balanced Fund for Q1. Join Michael McCulloch as he gives a Q1 update for the Global Alpha fund. Join Fund Manager Urs Beck as he presents a Q1 update for the Swiss Select Equity fund. Join Co-fund manager of the Euro Value Credit fund Roberto Matta as he takes you through the performance for his Fixed Income fund. 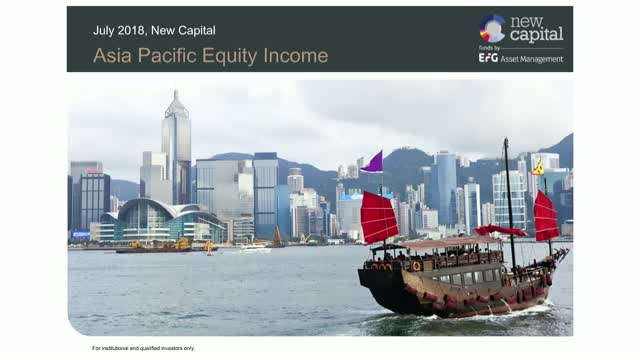 Join Tony Jordan as he goes through the Q4 performance of the Asia Pacific Equity Income fund. Join Bibiana Carretero as she goes through the Q4 performance of the Dynamic European Equity fund, and the outlook for the upcoming quarter. Join Michael McCulloch for the webinar on the Global Alpha fund where he will discuss the fund's performance and the outlook for the coming year. Join the fund team for the China Equity Fund for their presentation on Q418 and for the outlook into 2019. Urs Beck will provide an update on the Swiss Select equity fund Q4 FY Review. New Capital is a specialist investment house, with high-conviction funds designed to produce long-term outperformance for clients. New Capital is a brand of EFG Asset Management, the investment arm of global private banking group EFG International. New Capital UCITS funds are accessible via over 20 platforms and are registered for sale in Austria, France, Germany, Hong Kong, Luxembourg, Singapore (accredited investors only), Spain, Sweden, Switzerland, The Netherlands and UK.